An integral part of Cebu City’s past and one of its oldest landmarks, the renowned Fuente Osmeña, will get a facelift as the Cebu City Government embarks on a beautification campaign to showcase its historical significance. Cebu City Mayor Michael Rama together with Gov. Gwen Garcia last week led a unity walk to kick off the beautification project of Fuente Osmeña, which needed P50M for its beautification efforts. Part of the beautification plan is to restore the sidewalks within Osmeña Boulevard, which vendors have practically taken over reducing greatly the space for pedestrians. The mayor promised a relocation site within the area for the vendors so as not to disrupt their livelihood. Rama said sacrifices have to be made but that street vendors would be taken cared of as their support and cooperation is needed in promoting the city’s culture and history through the beautification project. The chairman of the Cebu Beautification Movement, Inc., Mariquita Salimbangon-Yeung, has aimed for a zero-vendor count around the Fuente Osmeña circle and along the boulevard. Several establishments in the area have expressed their support for the project and committed to spruce up their building for an appearance depicting the Spanish colonial era. Two financial establishments along Osmeña Boulevard, the Bangko Sentral ng Pilipinas and Banco de Oro, have promised to beautify their own front yards, this is reported. The project has gotten the nod of local business groups as the Cebu Chamber of Commerce and Industry and the Filipino Chinese Chamber of Commerce have pledged financial support to jump start the beautification efforts. Any financial donation made to the project will be posted at the city government’s website for transparency, this is said. Even Gov. Garcia has recognized the value of the project saying it is part of the province’s thrust to promote and showcase Cebu’s rich cultural history assuring that Capitol will provide assistance to realize the project. 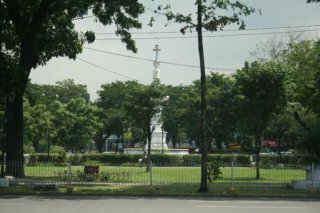 Fuente Osmeña is often described as the ‘Heart of Cebu’ with its strategic location at the center of Cebu City. It was built in honor of Cebu’s Grand Old Man, the late President Sergio Osmeña. Its literal meaning ‘Fountain of Osmeña,’ refers to the fountain built in commemoration of the foundation of the city’s first waterworks system in 1923. As a Cebu City landmark, its historical significance cannot be discounted as the fountain inside the Fuente Osmeña Circle is seen at the right side of the P50-peso bill with the face of the late President Osmeña at the center of the same bill.